Recently, I had the privilege of attending a blogger dinner held at Rivera in Downtown LA to preview the new menu, a new concept that combines three categories of Chef John Sedlar’s interpretations of Latin cuisines. Sangre encompasses dishes inspired by the Iberian roots of Latin cooking, Samba is comprised of those with South American, Central American, and Caribbean influences and the Playa Bar menu incorporates seafood-themed cuisine inspired by Mexico. Each of them are served in specific dining rooms in Rivera and come complete with “sound bites,” or the explanations and history behindÂ each dish.Â The Conexiones menu is the main menu that is served throughout the restaurant and, overall, emphasizes the connection between those Latin roots and our city. 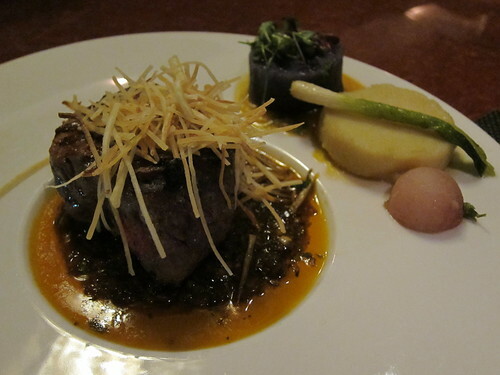 Local Californian ingredients are used, giving each dish its unique flair and that fresh, home-grown touch. In an interactive spin that’s brand new at Rivera (and probably anywhere), diners who want to know more about particular dishes are directed by the menus to call 1-310-464-6884 and follow the prompts to hear Angeleno Magazine’s 2009 Chef of the Year Chef Sedlar personally explain the history and preparation of each selected dish. There was a seemingly endless stream of dishes that came in threes this night, and while Chef Sedlar’s cooking is always exciting, I’ll prioritize detailing dishes that topped my list and save you the 15 dish-long play-by-play. My first and secondÂ favorites hail from the small plates menu.Â I’ve always been a fan of gazpacho, and if this is “traditional” then perhaps I’ve been missing the execution in so many others. 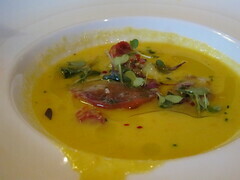 I loved that it made with golden tomatoes, decidedly sweeter than any orange variety I’ve had.Â I really enjoyed this cold butÂ indulgentÂ soup. It was interesting to recall the colors as I learned later (through the press release, but diners will learn by calling the number) that before Columbus, gazpacho was white, not red, because it did not yet contain the fruits of the New World: Tomatoes and peppers. The Flan de Elote ($11)Â was another elegantly simple – and sweet – dish, with a light corn custard topped by black quinoa and dressed with squash blossom sauce. As for mains, my favorite was the Parilla from the Conexiones menu, a rib-eye fillet dressed with and surrounded by habanero chimmichurri and garnished with yucca chips. The center was appropriately pink, retaining the cut’s flavorÂ while the chimmichurri remained subtle. The most impressive dessert that we were served from the dessert menu was the Xochimilco,Â the Ancho Chile Chocolate Cake, Avocado Mousse and Lime Pepper Sauce. 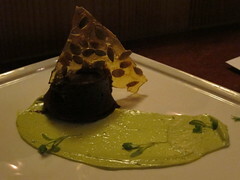 The chocolate cake was beautifully potent and the smear of avocado mousse was veryÂ soothing. This is a dessert perfect for dark chocolate lovers. 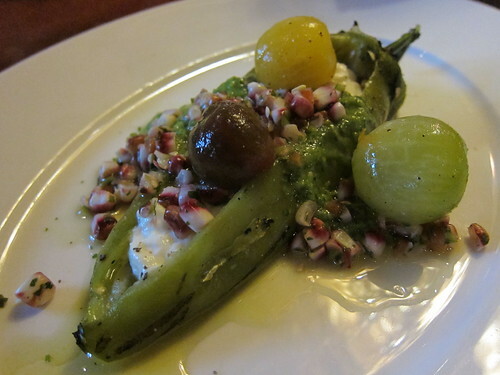 Rivera has earned its reputation for the best Southwestern and Latin cuisine in Los Angeles – but has found a way to continue keeping its approach fresh by offering an interactive, customized and even educational dining experience. Wine pairing notes as well as thoughts on “Spiceology” are also available from the chef. If cocktails are more your speed, anecdotes on tequila and mezcal are also available (as well as Julian Cox’s expertise, of course). And if you would rather leave everything to the Chef Sedlar, the Conexiones tasting menu is $70 per person when ordered by the whole table. With its ultra-modern dining room providing a complementary ambiance to the food, there are many dinners to be had at Rivera while enjoying a completely different story each time. 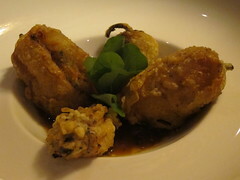 This entry was posted in cocktails, Downtown LA, Food, wine and tagged Chef John Sedlar, chile relleno, cuisine, dessert, Downtown LA, DTLA, Food, Latin, los angeles, mexican, Portugal, rib-eye, Rivera, South American, Southwestern, spain, Spanish, wine. Bookmark the permalink.